• Blank custom thundersticks are the original noisemaker. Sold in pairs, these loud noise makers are certain to make plenty of noise at your next big event or game. • Choose from an assortment of colors and design your blank inflatable cheering sticks today! Effective and inexpensive marketing tool for businesses looking to expand. 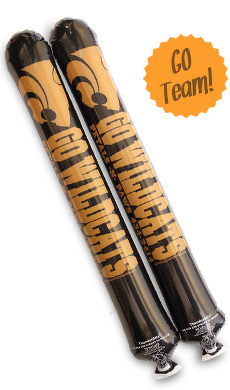 • Blank thunderstix noisemakers are made with our durable, high quality material. I ordered Thunderstix for a basketball game and I was more than impressed with the speed of delivery without charging a fortune for it. We have not used them yet so I can't rate them, but the service was fabulous !! Thanks!! Items shipped same day and since we were one state away we received them the next day! Have to figure out how to blow up - but very easy once you figure it out. Very good noise maker - they really make a statement with both color and sound. Very pleased with the quality and timely deliver. Definitely will use your company should the need for Thunderstix come in the future. Thank you. Thank you so much for how quickly you shipped out our order. We are very happy with our experience and will be ordering from you again in the near future. Thank you and God Bless you and your company. Company kept all promises and stixs met expectations. Thank you. Thanks to your Thunderstix our students showed amazing school spirit at our homecoming pep rally and football game that night. We got so many compliments! I will try to email some pictures when I get them from our photo team. Thanks so much for a great experience. Worked great...kids had fun decorating them. Great and Prompt Service. We received them quickly and in time for our event as promised. They worked out great also. Thanks. Good price and quick delivery!